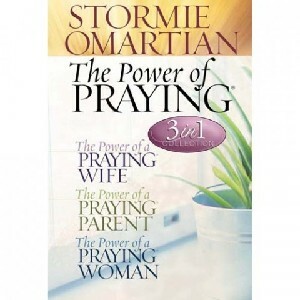 ~MILLIONS OF READERS around the world have been touched by Stormie Omartian's powerful, encouraging, life-changing books on prayer. Now three of her most popular have been combined into one volume, mak ing the contents of these special books conveniently available just for you. The Power of a Praying Wife will gently remind you that God is listening to your prayers. As you seek His direction and gui dance for your marriage, you will discover the amazing plans He has for your unique relationship with your husband. The Power of a Praying Parent will help you in your quest to do your very best for y our children. Stormie's compassionate mother's heart reaches out to you with empathy and wisdom as she shares her prayers and motherhood journey. The Power of a Praying Woman specifically looks at key areas of your life - emotions, health, work, relationships, and more - so that you can bathe them with the power of prayer and then rejoice in new depth, growth, and fruitfulness. This special 3-in-1 treasury of woman-to-woman insight will show you how to communicate with a God who longs to strengthen and support you in your crucial roles of wife, mother, and friend.